An Indonesian mask carved in the form of a male figure. 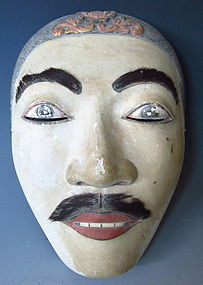 The mask is carved and painted with fur used to express the eye brows and mustache. A symbol like form is carved on the back of the mask to bless the mask and to animate the mask when being used. These masks are often used in Bali and Java during religious ceremonies performing the legend of the Hindu gods. Age: 19th-20th century. 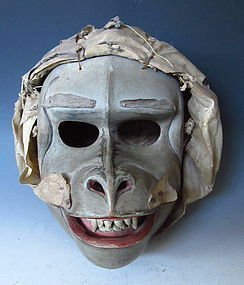 Size: Length: 8.25" Width: 3.25" Height" 7.5"
An Indonesian Mask carved in the form of a monkey. The mask is carved into two separate section, one is the top area of the head and the bottom is the jaw area. The mask is attached with a head covering made from strips of leather. The islands of Java and Bali are the two key regions that have the art of mask dancing often depicting religious stories. Age: 19th-20th century Size: Length: 8.25" Width: 8.5" Height: 9.5"
Beautiful Japanese antique highly carved butsudan panel, carved with scene of two dragons in swirling clouds and crashing waves, black and gilt lacquer with details in red, the eyes of the dragons are made of reverse painted glass, framed in black lacquer frame with copper hardware. 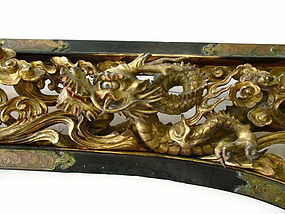 This piece was once a ranma or transom over the interior doors of a large Buddhist butsudan shrine. Meiji Period. Size: 9" high x 44" long. Carving is up to 3" deep. 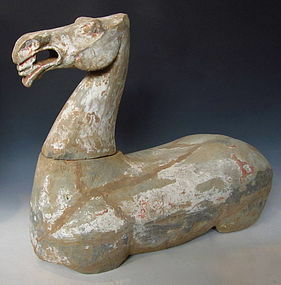 Beautiful Chinese tomb pottery horse in two pieces, sculpted of gray clay and painted with slip, wonderful dramatic shape, expressive face with open mouth, painted with white slip, traces of orange and black slip details especially on the head and face. Han Dynasty 206 B.C. - A.D. 220. Size:16 3/4" high x 20" wide x 7" deep. 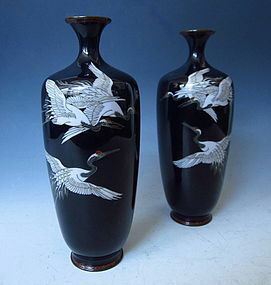 A pair of superb cloisonne vases with fine decorations of cranes flying in the evening sky. Cranes are an auspicious motif in East Asia, often a symbol of longevity and fortune. Has original box. 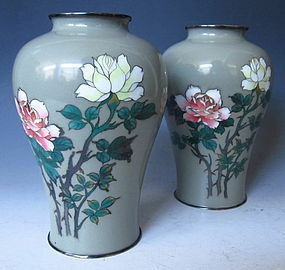 Age: early 20th century Size: Diameter: 2.5" Height: 7.25"
A beautiful pair of Japanese cloisonne vases decorated with a pair of roses set on a grey celadon colored background. The vases have silver rims on the mouth and foot of the vase. 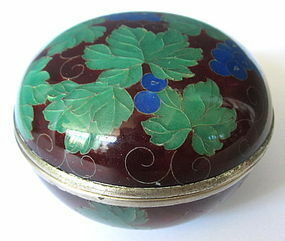 Age: 20th century Size: Diameter 3.8" Height 6.25"
Antique Japanese plique-a-jour round box. It is decorated with grapes and leaves on a maroon background. It measures 3" diameter, 2.5" tall. Taisho Period (early 20th century). 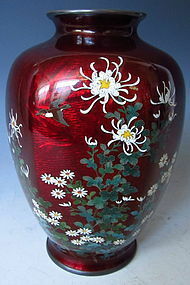 Japanese plique-a-jour bowl with roses and plum blossoms. 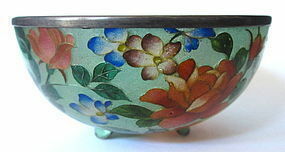 The bowl has a silver rim and small feet. Red roses with blue and maroon plum blossoms on a green ground. It measures 3.25" diameter, 2" tall. Meiji Period 1868-1912. An interesting Chinese table separated into two sections. The six legs fold together, making the table easy to store. The fluted stripe like moulding on the table appears often with Chinese furniture from the Republic period. Age: Republic Period (c1900). 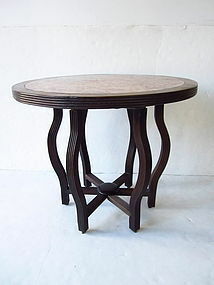 Size: height 28.5" diameter 33"